Crushing on someone can be rough, especially if you have no idea how to strike up a conversation to get things rolling (THIS IS ALL OF US). Lucky for us, Caitlin Whitlock has uncovered the mystery! All the way back in March, it seems Whitlock stumbled upon an old copy of the American Girl book, A Smart Girl’s Guide to Boys at her parents’ house and — OMG! — where has this book been all of my life?! From “surviving crushes” to “staying true to yourself,” this 2001 gem also offers the very thing Whitlock found, and bravely tested — “conversation starters.” She chose one unique line that spread across the Twitterverse like wildfire: “I wish they’d teach us more about vikings.” Random? Sure. Intriguing? Probably. And we’re just now learning about this movement, so excuse us while we read through these tweets and laugh forever. Here’s Whitlock’s first attempt at using the line. The reaction is priceless (and probably how most of us would reply)! 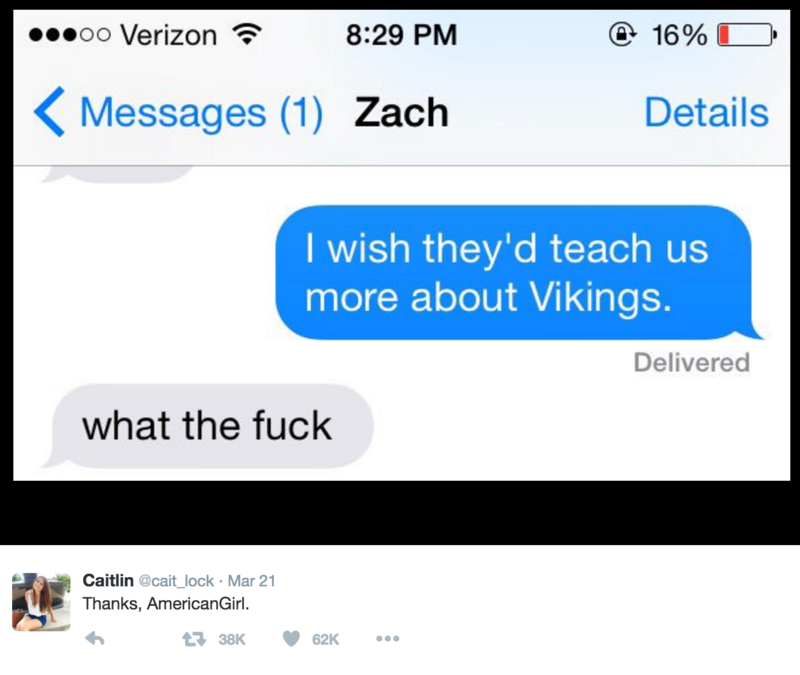 This text inspired a movement as others tried the same line on their crushes. The results, though, were a mixed bag. Ouch, David! Thankfully, Nick totally gets it in the Tweet below. Sorry to some, but Ben raises the bar on the viking phenomenon in a big way. 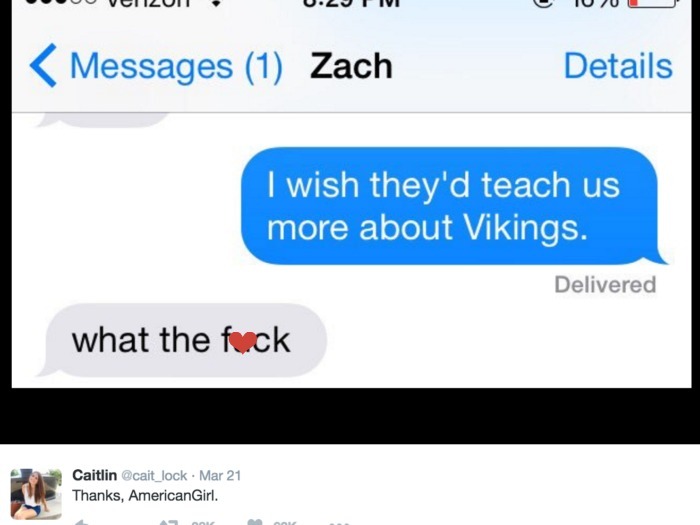 The downside of all this viking talk? Some people get pretty annoyed and the conversation literally goes nowhere, as seen below. We don’t know about you, but we’re grabbing our phones to test this line out for ourselves! Thanks for the conversation confidence booster, AG!